"All the power on earth can't change destiny." The Godfather III concludes the trilogy of Mario Puzo’s crime story of the Corleone Family, the prominent head of the mafia world. 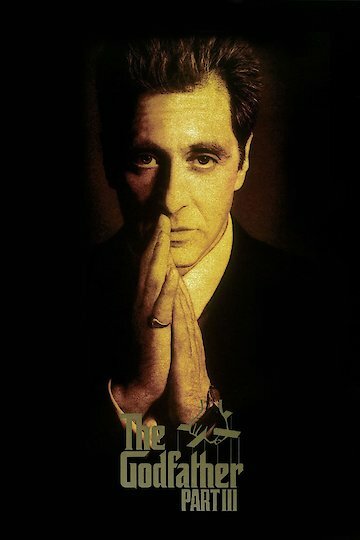 This final chapter of corruption Michael (Al Pacino), youngest son of Godfather Vito Corleone tries to legitimize the family business through his daughter Mary (Sofia Coppola). The story opens at the elaborate Catholic ceremony recognizing Michael as Commander of the Order of St. Sebastian. During the reception at his home, ex-wife Kay (Diane Keaton) brings their son Anthony in to tell his father that he dropped out of law school to become an opera singer. At the same time his sister Connie (Talia Shire) brings in the illegitimate son from his brother Sonny, Anthony (Andy Garcia) who is much like his impulsive father. He wants Michael to set Joey Zasa (Joe Montagna) who runs the illegal part of the family business straight. Michael wants no part of this and tries to get the two to get along. Vincent bites Zasa’s ear and the feud continues. This draws Michael back into the crime portion of the family and he keeps Vincent close by his side. Meanwhile, Zasa schemes with other members of the crime families to get rid of Michael. The plan backfires, and Vincent gets Michael to safety. Upset, he is hospitalized with a diabetic stroke. In an effort to get well and atone for his ruthless ways, especially killing his brother Fredo, he returns to Sicily where the family will attend the debut of Anthony’s opera career. He knows about the plot to assisinate him so he devises a plan. The payback to the disgruntled families is similar to the one in Godfather I when he kills all the people who murdered his father during the christening of his sister’s baby The dramatic and tragic conclusion comes when his daughter Mary is shot and killed instead of him while leaving the opera debut. He knows this has been the ultimate sacrifice and repayment of all his sins, so he dies alone in Sicily. The Godfather Part III is currently available to watch and stream, buy on demand at Amazon, Vudu, Google Play, iTunes, YouTube VOD online.